A study by researchers at University of Colorado Cancer Center and Oregon Health & Science University published today in the Journal of the American Medical Association Network shows that breast cancers diagnosed in young women within 10 years of giving birth are more likely to metastasize, and thus more likely to cause death, than breast cancers in young women who gave birth less recently or not at all. 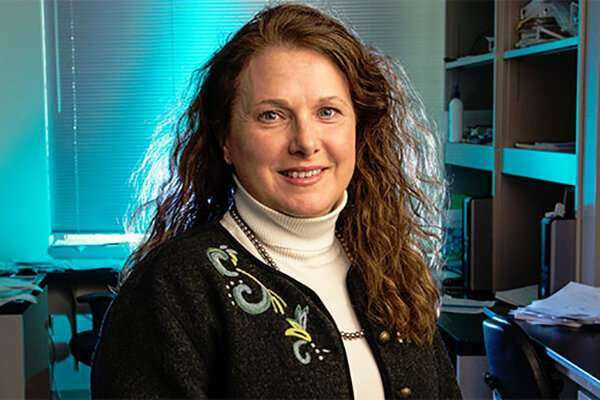 "This is the first study to demonstrate that a postpartum breast cancer diagnosed up to ten years after last childbirth can independently increase a woman's risk for developing metastasis to other parts of the body," says Virginia Borges, MD, MMSc, director of the Breast Cancer Research Program and Young Women's Breast Cancer Translational Program at CU Cancer Center. Borges is co-senior author on the study with longtime collaborator, Pepper Schedin, Ph.D. at OHSU. One of the co-first authors, Erica Goddard, Ph.D., began her doctoral work at CU Cancer Center and completed it at OHSU in the lab of Schedin, co-mentored by Borges. Dr. Goddard is now a postdoctoral researcher at Fred Hutchinson Cancer Research Center. The team analyzed the data of 701 female breast cancer patients, ages 45 and below, included in the Colorado Young Women's Breast Cancer Cohort. Researchers compared the risk for developing distant metastases among three groups: Women who had never had a child; women who had their last childbirth within the past 10 years; and women with children born more than ten years prior to their diagnosis. This risk for developing metastases in these groups was also evaluated across well-known breast cancer risk features. The increased risk for metastasis was highest in the women up to ten years postpartum and was most pronounced in women with stage I or II breast cancer, with a 3.5-to-5 times higher risk than women with similar, non-pregnancy associated cancers. For estrogen-receptor positive tumors, increased risk of metastasis was present up to 15 years post-diagnosis, approaching the level of metastasis risk associated with dangerous forms of breast cancer including ER-negative and triple-negative breast cancers. "In these cancers, the tumors themselves do not appear different—there's no difference in the percent that are more aggressive subtypes, such as triple-negative or Her 2, no difference in the stage at which they are diagnosed, or other differences in classic measures that you might think would increase the chance of a bad prognosis," Borges says. "Instead, these data support previous findings from our team's lab work showing that after childbirth, conditions in surrounding breast tissue may aid the development of metastases. For example, we have shown that the laying down of new lymph channels in breast tissue after childbirth and nursing may allow cancer cells to better travel and seed sites of metastasis; sure enough, the current work finds more women having cancer in their lymph nodes at diagnosis." According to the National Cancer Institute, every year 25,000 women below the age of 45 are diagnosed with breast cancer in the United States. Data from the current study suggest that about 45 percent of these cancers occur within 10 years of childbirth, meaning that annually just over 11,000 American women are at increased risk of metastasis from postpartum breast cancer. "These findings highlight the need to understand that postpartum breast cancer may represent a unique subtype of cancer that requires distinct care. All women know when they last gave birth, so this is a readily available, free piece of information that helps us identify young women at highest risk from their breast cancer," Borges says. "If we are aware of the increased risk, we can work towards finding the best means to overcome this risk and treat it appropriately."